Special Report: Winter Damage on Lawns | Gardens Alive! Q. Our question this week comes from my neighbors! Like many of you, our area endured a really wet, snowy winter; and once you get snow on top of snow on top of snow, a plow can easily lose track of where a driveway ends and a lawn begins. Plus, a lot of cars got parked on lawns when the turf was sopping wet. The inevitable result is a lot of ruts, depressions and valleys, mostly at the edges of the lawns. To learn how best to try and repair such damage, we called our favorite turf grass expert: Iowa State University's Dr. Nick Christians, whose research pioneered the use of corn gluten meal as a natural springtime 'weed and feed' crabgrass preventer. A. "Boy—did you call the right guy; I just had to do this job myself," replied Nick, who explained that "a plow scraped up a big piece of my sod and tossed it way back onto the rest of the lawn, where it sat under snow the rest of the winter. That's not ideal, of course, but it's a lot better than the plow taking the sod down the road a mile or so. "As soon as the snow melted, we moved it back into place," he continued. "It was a big chunk, so we cut it into sections that were easier to carry. It's bluegrass, so it'll spread to fill in any lines when the weather warms up. "You should do the same with tire depressions and other small ruts. If the sod is still there, lift it out as carefully as possible, fill in the hole and then lay the piece back overtop—just as you would if you were planting new sod. But you have to fill the hole correctly if you want the area to be level afterwards, "warned Nick". If you just shovel in some dirt and lay the sod, the new soil will sink down and you'll have a low spot. "The secret is to really soak the soil with water when you fill the hole back up; make it soupy wet; spongy wet. Then lay the sod on top so it's about an inch higher than the surrounding soil and then gently level things out. My wife and I each stepped on opposite ends of a 2' by 8' to level the sod at one end, and then repeated this across the entire area. Then stay away from that part of the lawn as long as you can afterwards to let the patch settle in. "If the old turf isn't visibly there, you can try installing a new piece of sod to repair the damage, but it can be really difficult to match up grasses. You'd be amazed at how different the blade shapes and colors can be—even in the same family, like bluegrass to bluegrass or fescue to fescue. And if it doesn't match, that patch will stand out like a sore thumb. I'd rather use a piece from an out-of-the-way area of the same lawn. If it's bluegrass or another spreading type, the bare spot will fill in naturally. Otherwise, just tolerate it until mid-August; then sow some matching seed back there." You know; it occurs to Your Humble Host that this 'problem'—having to take a 'turf graft' from your lawn to repair damage—might actually be an opportunity. Nick: How about we take the patch from a really sunny area of the lawn—removing it carefully with a carpet knife or sod cutter—and then build a nice little raised bed in the de-turfed area? A couple of tomato plants, some peppers, a cucumber...you can have your patch and eat it too." "I like it," replied Nick. "People would never know that you hadn't been planning it that way the whole time." Q. Mike: The city gave my neighbors and I a gift over the winter: The snow they removed from the road dumped on our front lawns. How will the salt concentration in the snow affect our lawns? I'm sure rock salt was used, and the mounds were over five feet high! A. Ah, yes; that's the DC area, where y'all got a record amount of white stuff this winter. And your region is—shall we say—not as 'well prepared' for blizzards as the far Northern parts of the country, where snow removal is a well-practiced art. So while your road crew's 'solution' was far from ideal, you have to realize that they haven't had much practice at this kind of thing. And they never had to deal with that much all at once before. The best way to minimize the effects of salt and other deicing chemicals on plants is dilution; so the more snow that was in the mix the better. And I happen to know that your area got some heavy rains right after the snow melted; that's the best thing that could have happened. If the after-snow weather had been freakishly dry, you might have had to water the lawn to wash away some of the salt. But nature did that for you. A final thought: If you typically use chemical fertilizers, this would be the season to go natural with corn gluten meal or compost instead. 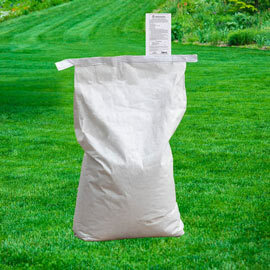 Those 'high-number' chemical lawn fertilizers are salt-based, and would only add to the osmotic load of your lawn.